Marketing often feels like a game of hitting big numbers — we want tons of traffic, all the clicks, and loads of leads. And then there's the bigger picture — we want all that activity to turn into lots of revenue. But what happens to connect those typical marketing metrics to the bottom line is often a black box — lots of unknown reasons behind all the conversion rates, especially at the top of the funnel. One key question: how do you know you're getting the right people in the door in the first place? More importantly: how do you know earlier, without having to wait and see what the mass of leads that get into the very top of the funnel looks like on the other end of the qualification and sales processes? This knowledge is all the more important in B2B marketing, where you're trying to reach a more targeted market over a longer cycle than the wider net that B2C businesses cast. Insights about your efforts to build awareness provide valuable indicators, not only for the overall success of particular campaigns but whether you're making the right long-term investments in B2B marketing efforts, time, and spend. In this article, we'll explain how to use data to gain more understanding over the effectiveness of your marketing efforts so you can better maximize results. It all starts, of course, at the beginning: the goal of expanding reach. Ideally, you're trying to build awareness by attracting more people into your world and introducing them to your brand: whether it's through inbound efforts like publishing thought leadership or other content marketing and running ads or throwing events or doing outbound. But all these expansion efforts are for naught if you're not expanding in the right direction. You inevitably face an inherent conflict—you could drive a lot of traffic at a low price, but remain concerned about the quality of that traffic. Conversely, more expensive traffic has an implied degree of quality, but a lack of proof to confirm this is true. So what provides better proof of quality that you're driving the kind of traffic that is meaningful to your business? The vast majority of people who visit your site leave without filling out a form or signing up for something — just think about your website conversion rates. You don't know much about these mystery visitors other than some contextual data that Google Analytics can provide (like referral sources, location, browser) — and that they're interested enough to come to your site. what are your target segments viewing? which sources were most successful in driving your target audience to key pages? which advertising platform is effective for a particular segment? what kind of ad creative is most effective in driving interest from our target named accounts? is my ad campaign driving enough qualified traffic back to the site to justify the cost? Let's look at some examples about how you could measure meaningful reach into target audiences based on company size. The target audience for Outreach, a sales engagement platform, included companies with employee counts between 50 and 1000 employees. Using Clearbit Reveal, they created a custom dimension in Google Analytics based on company size in order to analyze their blog readership. The Outreach team wanted to find out which specific posts were performing best with their highest-value audience. This post about cold calling strategies, for example, was successfully attracting people who worked for companies with 51-250 employees (on target!). Notably, the direct goal of these blog posts was not to bring in immediate revenue. Instead, it was to create content that would appeal to a specific reader segment in the hopes of converting these individuals over time as a result of a combined sales and marketing strategy. As much as marketers would love conversion to happen in one interaction like reading a blog post and seeing a call-to-action, the reality is more complex. With the data uncovered by Reveal and Google Analytics, you can also gain insights into the traffic quality driven by particular ad platforms, campaigns, and ads. For instance, create a report to examine what sources of paid traffic are the most effective at getting people who fit your ideal customer profile (here, businesses in the pharmaceutical industry, with over 1000 employees) to click through to your site. The conversion numbers here might be low but they're interesting. It looks like much larger companies successfully converted through the Facebook ad campaign, which gives us positive feedback about using the Facebook platform as a strategic channel to target enterprise prospects. The folks at Outshine even came up with the concept of the "Clearbit Qualified User" as a measure of successful reach. They look at the cost per Clearbit Qualified User to determine "the effectiveness of reaching priority companies, providing a comparable metric of relative value for awareness efforts." The cost per Clearbit Qualified User is calculated by taking the costs of ads on one platform divided by the # of visitors in a target audience group. Using these methods, you can start to better understand where you should invest in your marketing portfolio. So you've set up Clearbit Reveal for Google Analytics and defined some target segments. 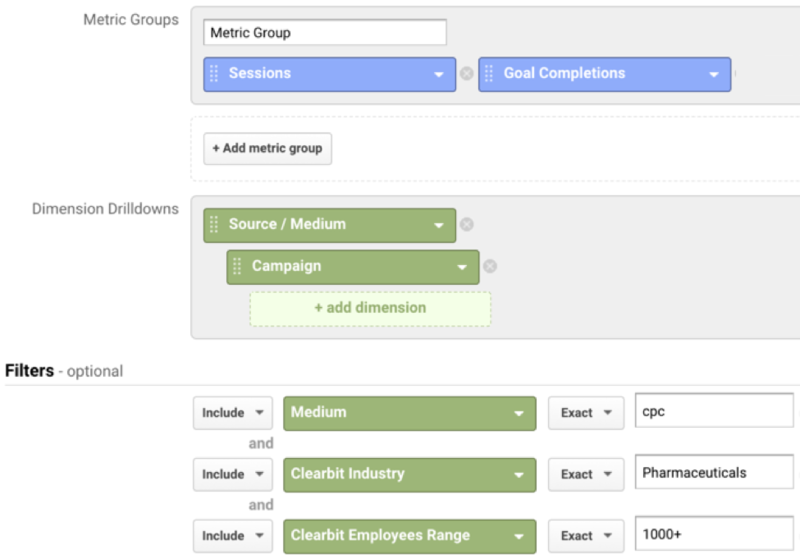 Once you have these new visibility powers, where do you get started digging into marketing attribution? Without data, marketing can run on a lot of assumptions. Once you've done an audit and have a basic understanding of who's coming in where, it's time for a quality check. Are you successfully targeting and driving your ideal audiences rather than any ol' audience? Where are you falling short? Now you can incorporate this validation step into future campaigns and projects. If early data shows that you're not reaching your intended audience, then you can run different experiments to identify more effective targeting strategies. Once you know that you're reaching the right audience, you can take more informed steps to refine messaging, optimize conversion, and drive down the cost of qualified users for specific campaigns and platforms. The learnings you accumulate can benefit your entire company – not just your marketing team – by helping everyone fully understand the best ways to connect with your target audience and even the market as a whole, like what customers really care about and what messaging strategy performs best at the beginning of the buyer's journey. While financial gains and customer wins are the driving force of most marketing campaigns, intent data surfaces important indicators of success like quality of audience reach. Marketing investments are a long-term game in B2B businesses. When a venture capitalist funds a young startup, she isn't expecting money to start flowing in the bank right away. Instead, she provides support and mentorship to help the new team make the most out of her initial financial investment. The hope is that her investment of time and resources will kick-start the company's long-term success. In the long run, she hopes for a multiplied return on investment. Keep your overall marketing moving in the right direction so that the money you invest is used as effectively as possible. The better you get at leveraging key insights about your customers that support overall campaign success, the closer you'll get to meeting your bigger picture marketing and business objectives.